Editor’s Note: Please read the following update from Vic Barrett, 19 year-old university student from White Plains, New York, 1 of 21 young plaintiffs taking the United States government to court to fight for their constitutional right to a world that can host full, thriving, and healthy lives. October 24, 2018 — Just last week, the Department of Justice petitioned the nation’s highest court in an attempt to stop our case from going to trial. The Supreme Court placed an administrative stay on the litigation effectively halting the lawsuit temporarily so that it could hear from our lawyers before issuing a decision. But despite the delay, we are confident that we will get our day in court. Over the last 3 years, we have overcome obstacle after obstacle in the fight to hold our federal government accountable for compromising the safety of our climate and our communities. Will you show your support for this historic climate lawsuit by rallying outside courthouses nationwide to demand the climate solutions we urgently need? Sign up here to join the rally near Davis. As youth, we have a vested interest in how climate change impacts humanity — because we’ll be on this planet longer than some of the people making the decisions jeopardizing our futures right now. We demand a just transition to 100% renewable energy for workers and communities. As plaintiffs, all 21 of us come from different walks of life: different regions, racial backgrounds, and economic classes. We stand united in our demand: a bold, science-based National Climate Recovery Plan to ensure that our generation and future generations can survive. Yet the US government continues to violate our constitutional rights by subsidizing and propping up Big Oil – by expanding fossil fuel extraction, production and combustion – and by continuing to perpetuate the global climate crisis. Make a difference by joining a local rally for the Climate Trial of the Century on October 28th or 29th. Since our government officials have actively contributed to the climate crisis for decades, we’re going to court to hold the government accountable for this crisis. We’re not afraid to do what it takes to challenge the halls of power to win the justice we need — and with so much at stake, we can’t afford to do anything less. P.S. The Climate Trial of the Century will last for several weeks, maybe even months. Be sure to follow along behind the scenes of the trial on the new podcast No Ordinary Lawsuit, commissioned by the nonprofit Our Children’s Trust. 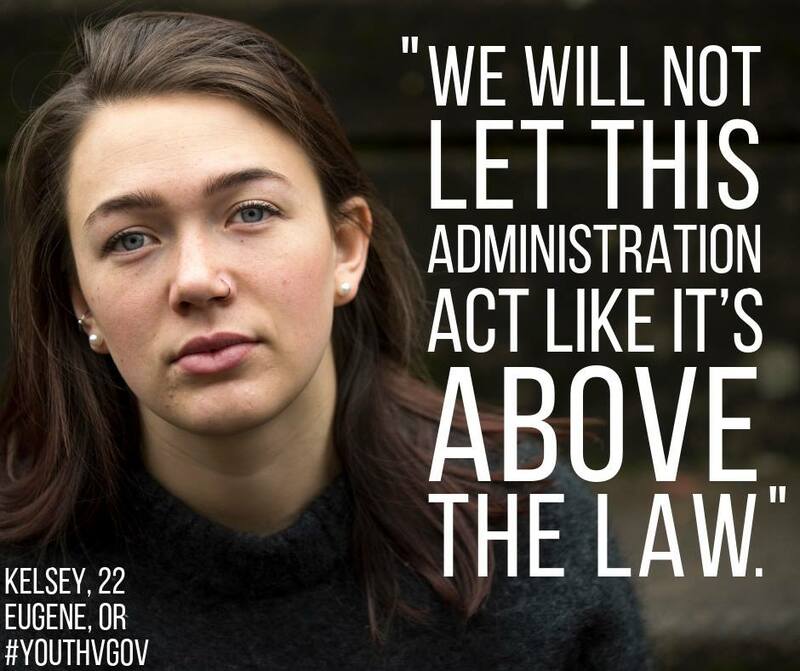 Eugene, Oregon, October 15, 2018 — Today, U.S. District Court Judge Ann Aiken ruled on the Trump administration’s motion for judgment on the pleadings (“MJP”) and motion for summary judgment (“MSJ”) in the landmark constitutional climate lawsuit Juliana v. United States, filed by 21 young Americans and supported by Our Children’s Trust. ● President Trump is dismissed as a defendant in the case without prejudice. government knowledge will be presented at trial. by federal defendants. Judge Aiken highlighted plaintiff expert declarations provided by Drs. review a court can apply. ● Trial in this case will begin as scheduled on October 29, 2018 in Eugene, Oregon. Visit Our Children’s Trust for more details from this October 15 press releases and other info. Visit Our Children’s Trust Facebook page (Youth v. Gov) for updates. The groundbreaking federal constitutional lawsuit, Juliana v U.S., supported by Our Children’s Trust, will begin on October 29th in Eugene, Oregon. Twenty-one youth will present evidence that the U.S. government substantially contributes to the climate crisis and that young people and future generations are disproportionately affected by it. On October 29th, the first day of the Juliana trial, people will rally outside federal courthouses across the country in solidarity with the young plaintiffs. 350.org is inviting supporters to host local rallies on October 28 or 29 to stand in solidarity with the youth plaintiffs as their landmark trial begins, or to find a join a local rally to support the youth holding our government accountable. These 21 youth, from many different backgrounds and communities, are uniting across race, class, and regions to fight for the planet and their lives. They are giving us all great hope. They are taking the Trump administration to court, demanding that our government address the climate crisis and protect our children and futures by implementing a science-based National Climate Recovery Plan. 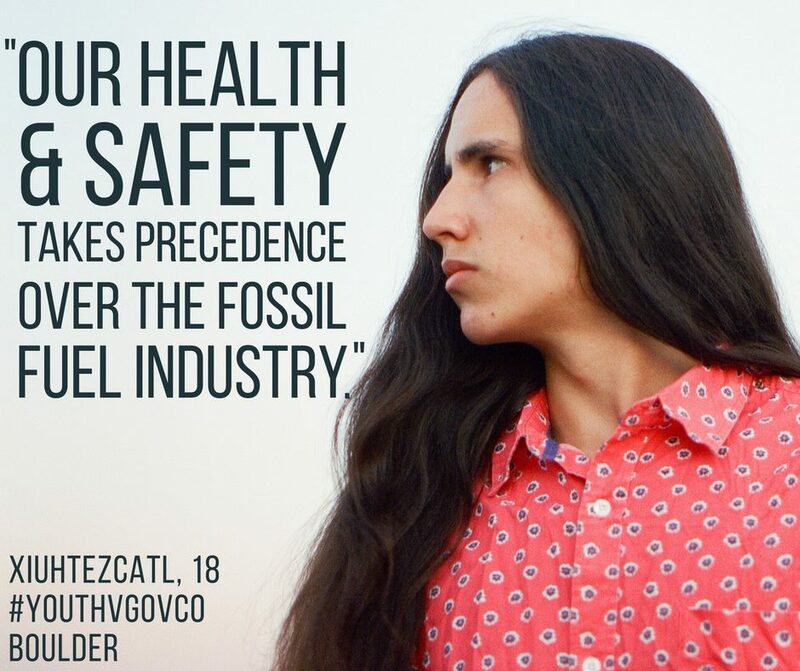 These 21 young plaintiffs are united by the fierce determination and desire to shift our economy away from fossil fuels to a renewable energy world that puts our communities first, and the youth will present this evidence in court. 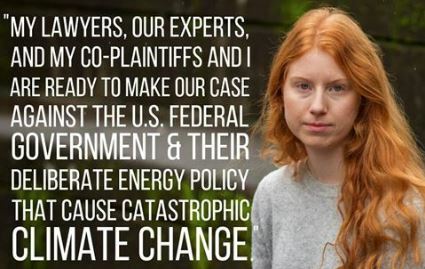 Juliana v. United States is not about the government’s failure to act on climate. 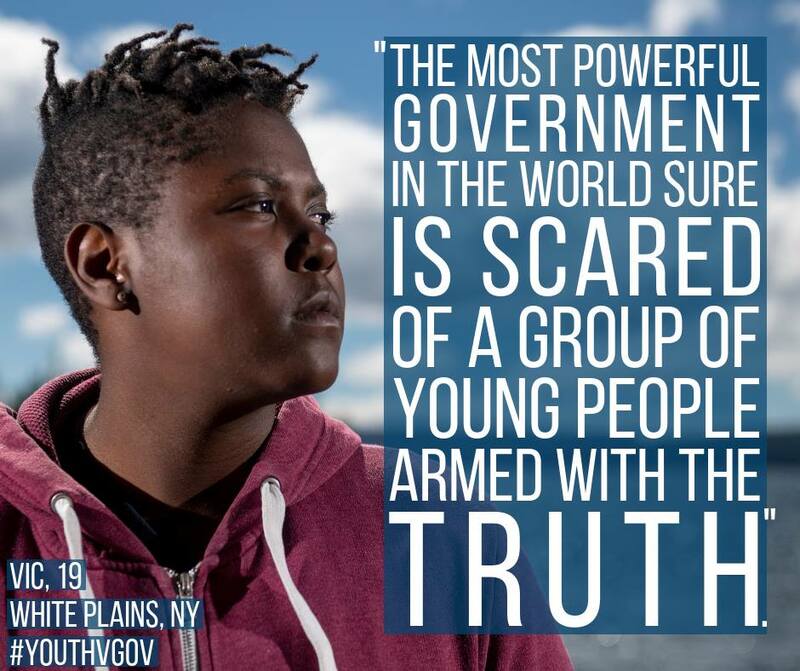 Instead, these young plaintiffs between the ages of 11 and 22, assert that the U.S. government, through its affirmative actions in creating a national energy system that causes climate change, is depriving them of their constitutional rights to life, liberty, and property, and has failed to protect essential public trust resources. The case is one of many related legal actions brought by youth in several states and countries, all supported by Our Children’s Trust, and all seeking science-based action by governments to stabilize the climate system. Counsel for Plaintif s are Julia Olson, Esq. of Eugene, OR, Philip L. Gregory, Esq. of Gregory Law Group of Redwood City, CA, and Andrea Rodgers, Esq. of Seattle, WA.